It's a good way to work with data. You don't need programming experience to get good results. Blocks contain powerful logic to manipulate your data stream. Profit from and support the open web, by consuming and producing open standards. Share your pipe to help others, or fork existing pipes to get immediate results. You enter data by pointing a block to an URL and an RSS (or Atom) feed. This feed then moves through your pipe, block by block, and each block can manipulate it. 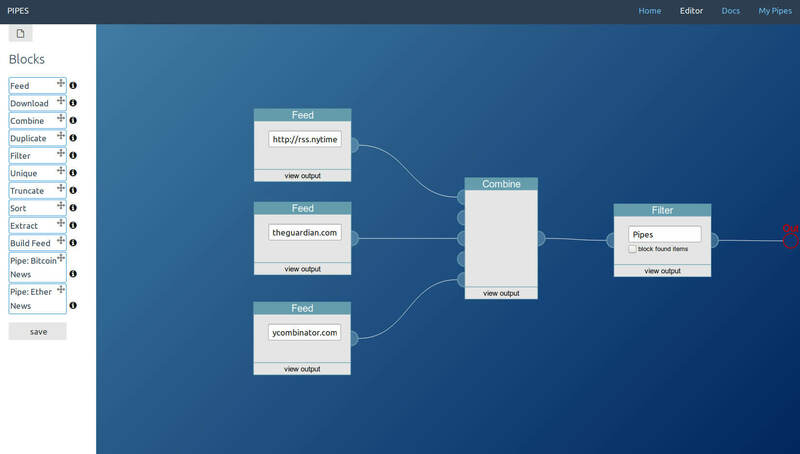 A simple example is combining multiple RSS feeds into one and filtering that combined data stream for a keyword. Pipes gets regular improvements. If you want to get a notification via email when this site gets a big update, feel free to enter your address here (I promise there won't be spam).